MANILA, Philippines — Philippine communist rebels declared a weeklong cease-fire Friday to promote the resumption of long-stalled peace talks aimed at ending one of Asia's longest-raging rebellions, adding they were open to discussing an extension of the truce if the government frees all political prisoners. The Communist Party of the Philippines and its armed wing, the New People's Army, said in a statement that the unilateral cease-fire would be in effect next week. Government and rebel negotiators are to resume talks in the Norwegian capital of Oslo on Monday. The Maoist guerrillas expressed hope the government would reciprocate with a similar cease-fire "as a show of all-out determination to move forward with peace negotiations," but said the rebel truce would proceed even if the government does not declare its own cease-fire. To further bolster peace talks, the rebels said they are "open to discuss the possibility of a longer cease-fire upon completion of the release of all political prisoners." Two top rebel leaders, Benito and Wilma Tiamzon, were freed from a maximum-security jail Friday to participate in the Norwegian-brokered peace talks. The rebels have welcomed the releases of several detained rebels who are to take part in the negotiations as consultants. Norwegian Foreign Minister Borge Brende will open the talks on Monday at an Oslo hotel, his ministry said in a statement. 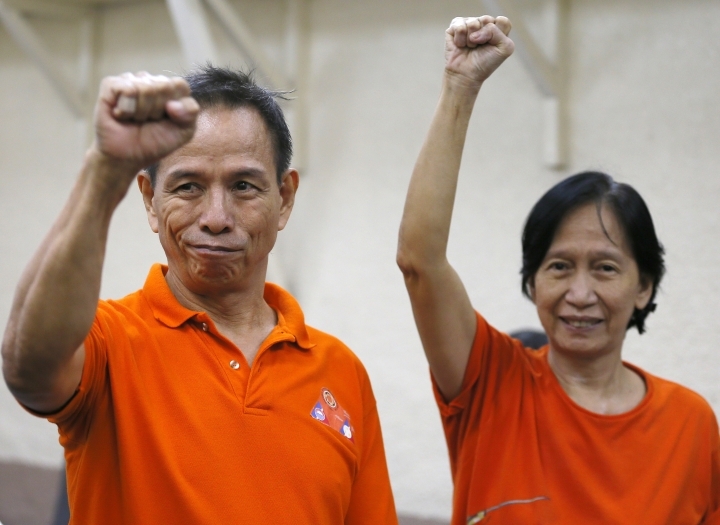 The Tiamzons smiled and raised their fists as they stepped out of detention at the national police headquarters, where their supporters greeted them. In a news conference, they thanked Philippine President Rodrigo Duterte for their release and for a restart of talks that will tackle wide-raging reforms in a bid to end the decades-long conflict. "These releases are goodwill measures that will create a positive environment for the progress of the peace talks," Benito Tiamzon said. His wife called on young people to become more involved in fighting the "monsters" of society. "For the Filipino youth and other countrymen now hooked on catching monsters in 'Pokemon Go,' you know, there are so many real monsters in our country," Wilma Tiamzon said to laughter in the room. "Instead of 'Pokemon Go,' what is better is Revolution Go." The insurgency has left about 150,000 combatants and civilians dead since it broke out in the late 1960s, drawing support from the ranks of those dissatisfied with economic inequality and the Philippines' alliance with the U.S. It also has stunted economic development, especially in areas of the countryside where the rebels are active. Benito Tiamzon is chairman of the CPP and the New People's Army, according to the military. Wilma is said to be the secretary general. Their release after posting bail on charges including multiple murders comes after an initial setback to the rebels' friendly ties with Duterte, who calls himself a leftist president. Duterte declared a cease-fire on July 25 but withdrew it five days later after the guerrillas killed a government militiaman and failed to declare their own truce within Duterte's deadline. But on Monday, Duterte met with the rebels' lawyers and allies at the presidential palace, smiling for cameras with linked arms. 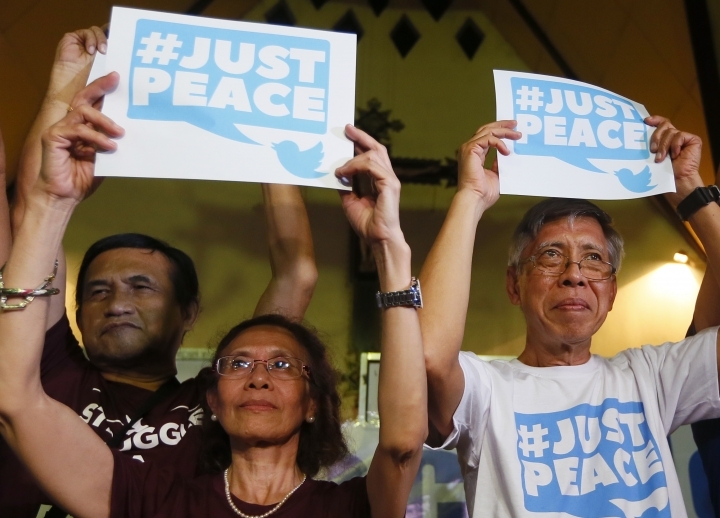 "The president said that while he was hurt by the sharp exchanges between him and CPP founding chair Jose Maria Sison ... he gave assurances that he will walk the extra mile for peace," presidential peace adviser Jesus Dureza said after that meeting. Under Duterte's predecessor, Benigno Aquino III, peace talks stalled over the government's refusal to heed a rebel demand for the release of some captured guerrillas. Duterte, however, has agreed to the release of rebels who would be involved in peace talks, and appointed two allies of the guerrillas to Cabinet posts in concessions aimed at fostering the talks. Associated Press writers Jim Gomez in Manila and Jan M. Olsen in Copenhagen, Denmark, contributed to this report.